Edward Weston (1886–1958) was the first photographer ever to be given a Guggenheim fellowship, resulting, as the artist himself realized, in the most prolific period of his life: 'With the exception of portraits and nudes, my Guggenheim period is a summation of my life-work.' Not surprisingly, therefore, he wanted his work seen, and he wanted it preserved. The Huntington Library in Southern California was suggested, and Weston, recognizing its suitability as one of the West’s premier cultural institutions, responded with 'quiet and intense joy'. 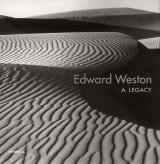 This is the first major book to celebrate The Huntington’s extraordinary collection of 500 Edward Weston photographs, all of them selected and printed for the institution by the artist himself in the 1940s. The Guggenheim photographs of the American West lie at the heart of this legacy, but Weston also included in his gift still-life studies from the early 1920s and 1930s, as well as later landscapes from the 1940s. Weston selected these photographs as representative of his best work, and they are stunningly reproduced in this landmark publication. Jennifer A. Watts is Curator of Photographs at the Huntington Library, San Marino, California.